Mineral Package Is as important as compound feed in Beef finishing diets. The importance of finishing beef cattle is all about efficiency. The overall target when it comes to finishing beef cattle is to achieve the maximum weight gain over a minimum number of days at minimum cost. There are a lot of factors that can affect the thrive of beef animals including: animal breed, animal age, the quality of forage available and overall health of the animal. As an industry we put a lot of focus on getting the right amount of the right feed ingredients into a beef finishing diet to ensure maximum thrive. The level of cereal, the starch content, the protein content and the fibre content required are all important factors to consider when formulating a beef finishing diet. However, if you formulate a beef finishing diet using only the best quality ingredients and forget to balance the diet with a mineral package that improves rumen function, promotes hoof care and herd health you will never achieve maximum thrive. In intensive feeding situations the mineral package that is included is every bit as important as the compound feed being fed. RumiGain mineral package will be available to purchase in 25Kg bags from all our Agristores. We will be officially launching RumiGain at this years Tullamore Show. Pop by our stand for more information and a chance to WIN 20x 25Kg bags of the RumiGain complete mineral package. 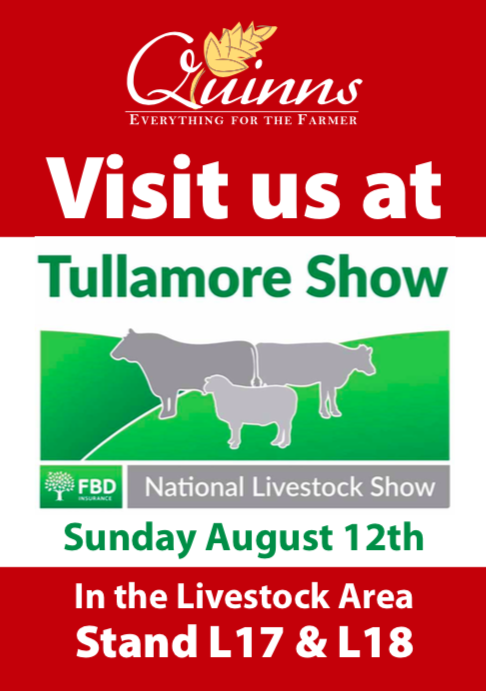 Come jon us at the Tullamore Show on Sunday 12th August. We will be at stand L17 & L18 – we look forward to seeing you there.